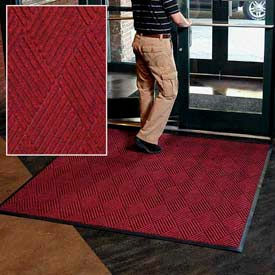 Mat Tech Scraper Entrance Mats Are Ideal For Small Retail Stores, Restaurants, Car Dealerships & More. Scraper mats are made out of strong nylon scraping fibers to handle rough conditions. Mats are easy to clean, only use a wet and dry vacuum and/or shake off. Chose from a variety of styles and sizes. Low Traffic mats are designed for up to 125 people per day. Medium Traffic can handle up to 500 people per day. Mat Tech Wiper Entrance Mats Are Ideal For Boutiques, Garages, Airports, High Schools, Universities & More. Wiper mats are designed for long lasting durability. Mats are easy to clean. Chose from a variety of styles and sizes. Low Traffic mats are designed for up to 125 people per day. Medium Traffic can handle up to 500 people per day. Heavy Traffic mates can handle more than 1500 people per day. 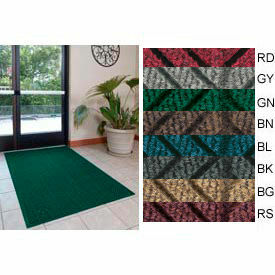 Entry Mats with Hi-Lo Rib Pattern Remove Dirt, Debris and Moisture From Shoes. These 18 oz./sq. yd. floor mats have 3/8 thick durable polypropylene fibers that are bonded to a slip and stain resistant vinyl base. Entrance mats can be used indoors or out. For Cut Length Mats, price is per linear foot. To specify orders in linear feet, please enter the number of mats desired in "Quantity" and add to the "Shopping Cart" where you can specify number of linear feet in "Length". Note: Allow a tolerance on cut mats for each side. For Custom Cut Length Mats in Inches (ex. 6'6" mat), please call toll-free number, 1-800-645-1232, for assistance. All custom cut mats are not returnable. Mat Tech Scraper/Wiper Combination Entrance Mats Are Designed For Side Entrances, Shopping Malls, Small Retail Stores & More. Dual purpose scraper/wiper mats brushes dirt and moisture from shoes and feature decorative patterns. 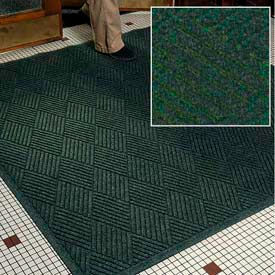 The Double Border Edges on These Heavy-Duty Entry Mats Trap Dirt and Water to Protect Floors and Prevent Slipping. These floor mats are made from fast drying blended fibers that are fade and stain resistant. 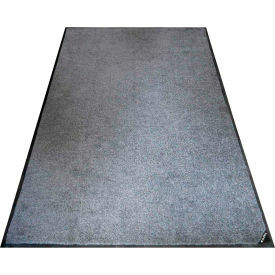 Heavy-duty reinforced entrance mats with a bi-level surface scrape debris from shoes while the recycled tire rubber backing grips the floor to prevent shifting or curling. These industrial mats can withstand years in heavy traffic indoors or out. For Cut Length Mats, price is per linear foot. To specify orders in linear feet, please enter the number of mats desired in "Quantity" and add to the "Shopping Cart" where you can specify number of linear feet in "Length". Note: Allow a tolerance on cut mats for each side. Custom Cut Mats are only cut in foot increments (Minimum Length 2' Ft.). All custom cut mats are not returnable. Note: 36"W mats are seamed with adhesive every 5' in length; 48"W mats are seamed every 6' in length. The dual rib border on one side of each mat is cut off and refinished to create extended cut lengths. Plush Super Absorbent Floor Mats And Entry Mats Are Designed For Lobbies, Foyers, Entryways And Other Indoor Light Traffic Areas. Floor Mats And Entry Mats have 72 mil. thick vinyl backing that minimizes movement. 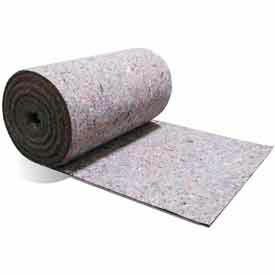 5/16" thick polypropylene fiber mats are fade and stain resistant for long lasting durability. Available styles are Stock Size, Custom Cut Length, and Full 60ft. Roll. Mat colors are Beige, Blue, Charcoal, Hunter Green, Red, Smoke, and Walnut. Dimensions vary per model. 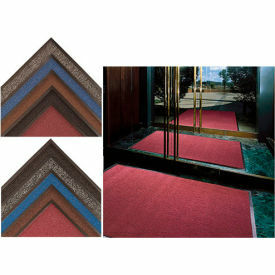 Entrance Mats Offer A Matching Beveled Edge For An Attractive, Finished Appearance. 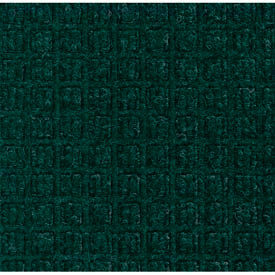 Carpet top is made from 100% post-consumer recycled PET polyester reclaimed from plastic bottles. 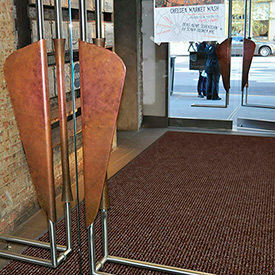 Entrance mats feature needle punched surface with rubber reinforced face pattern. 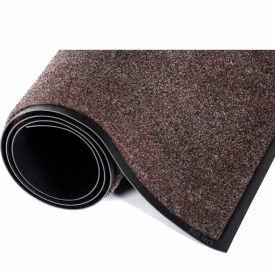 Carpet top fabric has a herringbone pattern for an attractive appearance. Backing is made with SBR rubber with 15% post-consumer recycled tires with a smooth back. 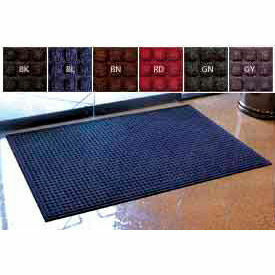 These 3/8 thick mats with rubber reinforced bi-level cleaning surface effectively stops dirt and moisture at the door. Beveled border with matching color for safety. Available in 8 colors. Passes Federal Flammability standard DOC FF 1-70. ANSI ESD s7.1 protection of electrostatic discharge. US Green Building Council member, NFSI certified. 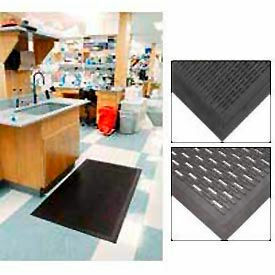 These Scraper Indoor & Outdoor Mats Effectively Scrape Off Dirt And Snow From Shoes And Are Great For Use By Sinks And Drinking Fountains. 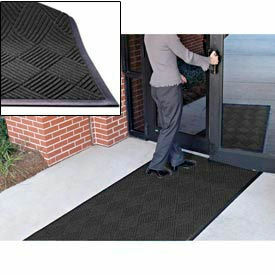 Entrance mats are made with a black natural, pliable rubber compound that is resistant to extreme weather conditions. 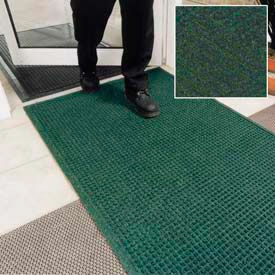 Scraper entrance mats are used for use in heavily trafficked outdoor entrances, water or drink fountains. 5/16" thick mats offer a low profile with beveled safety edges to accommodate tight doorways. A rated by MVSS 302 regulations against flammability. Vented Mat features an open slot design that provides quick-dry ventilation. 1 year conditional Limited Warranty. 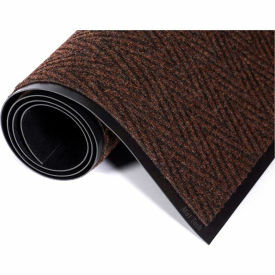 Reversible scraper mat features one side with flexible scrapers alternating with quick-dry drainage ports and the other side with clusters of stiff ridges. 7/16" thick with beveled edges offer trip resistance. Rated A per MVSS 302 standards for fire protection. 1 year conditional Limited Warranty. WaterHog™ Eco Premier Mats Effectively Stops Damaging Dirt And Moisture At The Door. Used for high traffic areas while maintaining maximum protection. 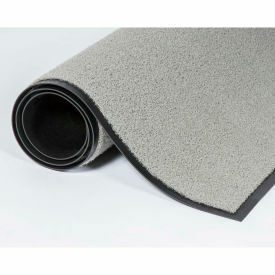 Rubber mat top surface is made of 100% post consumer recycled PET polyester fiber. Rubber backing is made using 15% post consumer recycled rubber. 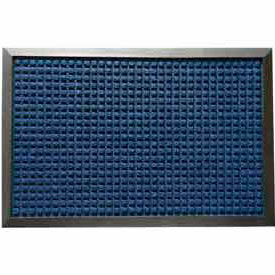 Rubber reinforced bi-level cleaning surface is permanently molded for long lasting comfort. Slip resistant surface stores water to prevent leaks on floor. Black rubber border for a slip resistant finish. NFSI certified. Green building council member and LEED EB certified. NoTrax Carpet Mats Are Used For Trapping Water Tracked Into Entryways. Mats are made with Olefin, Decalon, and Yarn for exceptional water absorption. 1/4" and 3/8" thick mats can be used indoors or outdoors. Wear-resistant fabric also helps scrape dirt off shoes. Choose from stock sizes or full 60 ft. rolls. Available in a wide variety of types, material, and color finishes. Heritage Rib offers a heavier-weight double rib high/low design that performs the scraping function of the mat. This medium to heavy traffic entrance mat is intended for areas that need extra moisture retention and scraping action and has 33% more carpet than many competitors’ “best" rib mats. Dantethe perfect product for all medium traffic areas including entrances and lobbies. 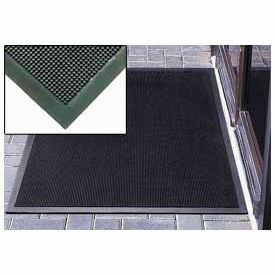 Waterhog Classic Entrance Mat Protects Commercial And Residential Entryways. Waterhog Classic Entrance Mats are designed using reinforced rubber face nubs for long lasting durability. The waffle design provides crush-proof scraping action while the raised rubber border creates a "water dam", keeping dirt, water and debris off of floors and carpets. Includes cleats on the backing. Heavy duty mats contain 20% recycled content and are certified slip-resistant by the National Floor Safety Institute. Available in Bluestone, Bordeaux, Charcoal, Dark Brown, Evergreen, Medium Blue, Medium Brown, Medium Gray, Navy and Red/Black. Sizes range from 2 ft. x 3 ft. to 6 ft. x 20 ft.
Andersen WaterHog™ Fashion Entrance Mats Are Used For Trapping Dirt And Water. 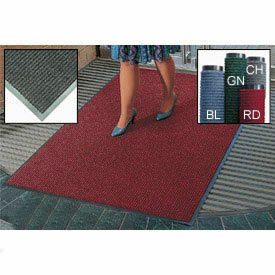 Andersen WaterHog™ Fashion Entrance Mats are made of 100% super-absorbent polypropylene for long lasting durability. The rubber reinforced face nubs and waffle design provide bi-level, crush-proof scraping action. The raised rubber "water dam" border traps dirt and water to help keep debris off floors and carpets. Good for indoor and outdoor use. The SBR rubber backing contains 20% recycled material. Certified slip-resistant by the National Floor Safety Institute. Sizes range from 2' x 3' to 6' x 20'. All styles 3/8" thick. Colors vary. Andersen WaterHog™ Classic Diamond Mats Are Used For Trapping Dirt And Water. Andersen WaterHog™ Fashion Diamond Mats are made of 100% super-absorbent polypropylene for long lasting durability. The rubber reinforced face nubs and classic diamond design provide bi-level, crush-proof scraping action. The rubber water dam border traps dirt and water to help keep debris off floors and carpets. Indoor and outdoor use. SBR rubber backing contains 20% recycled tire material. Sizes and colors vary by model. All styles are 3/8" thick. Andersen WaterHog™ Fashion Diamond Mats Are Used For Trapping Dirt And Water. Andersen WaterHog™ Fashion Diamond Mats are made of 100% super-absorbent polypropylene for long lasting durability. The rubber reinforced face nubs and diamond design provide bi-level, crush-proof scraping action. The matching fabric water dam border traps dirt and water to help keep debris off floors and carpets. Good for indoor and outdoor use. SBR rubber backing contains 20% recycled material. Certified slip-resistant by the National Floor Safety Institute. Sizes range from 2' x 3' to 6' x 20'. All styles 3/8" thick. Colors vary. Steel Link Matting Helps Keep Entranceways Clear Of Dirt, Mud, Gravel And Snow. 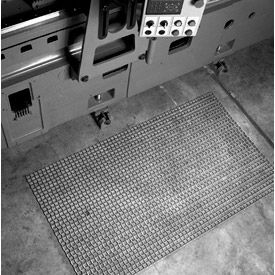 Steel Link Mats are flexible and rust resistant, and easily roll up for cleaning and storage. Provides thorough scraping action in any direction to clean footwear. Constructed of cold rolled strip steel, with 13 gauge galvanized steel connecting rods. 1" x 1" steel mesh, 3/8" thick. Chain link mat ends are smooth with plastic tubing. Available in a variety of sizes to suit any application. Spill Absorbent Traffic Rugs and Mats Provide Floor Protection For Industrial, Storage, Maintenance, and Other Applications. These spill absorbent traffic rugs and mats are made to protect floors near equipment, on sidewalks, and in areas with high traffic. The rugs and mats are made of polypropylene and acrylic materials for lasting durability. Poly-backed mats absorb both aggressive and non-aggressive fluids including water, oil, chemicals, and more. Carpet And Entrance Are Used For Applications Including Commercial, Medical, Hospitality, And More. Carpet and entrance are made of high quality materials for long lasting durability and corrosion resistance. Carpet prevents moisture and debris access from interior floors for surface protection and low maintenance. Water-resistant backing prevents moisture entry for added security. Units improve traction for slip prevention and user safety. Eco-friendly construction reduces carbon footprint for environmental stability. Styles are Entrance Mat and Elite Super Olefin Mat. Package quantity is 1. Mat Colors are Black, Blue, Brown, Burgundy, Charcoal, Dark Gray, Gray, Green, and more. Dimensions vary per model. NoTrax Stages Entry Mat SystemPrelude is a scraper mat made up of a coarse loop-twisted non-absorbent fiber that can be placed outside the entrance to begin the removal of dirt and debris from foot traffic. These aggressive fibers resist crushing while entrapping debris and preventing it from entering the facility. 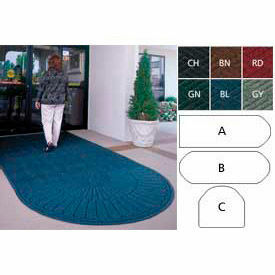 This mat can be used as part of the coordinated “Stages" entrance matting system. 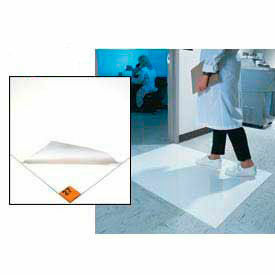 A heavyweight vinyl non-slip backing ensures minimum movement. Encore is an entrance mat that uses a combination of scraping and looped pile Decalon® drying yarns in a linear pattern, to facilitate the scraping function and begin the drying process. It can be used as a stand-alone mat, or as part of the “Stages" coordinated entrance matting system. Ovation™ is made with a generously tufted Decalon® looped pile construction that serves as the finishing, drying and cleaning mat in the coordinated “Stages" entrance matting system, A heavyweight vinyl non-slip backing ensures minimum movement.